Older style made in USA for the Sunbeam Mixmaster. It is a 1 1/2 quart size. No dents, but does have some superficial wear from use. 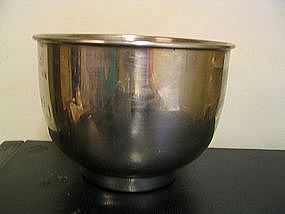 This was my icing bowl and I used it quite a bit. If interested, I have the model number of the mixer it fits. Please email for more photos. I need your zip code to calculate the postage.